A new poll shows more than 80% of people want cannabis to be legalised or decriminalised for terminal pain relief. Almost 65 per cent of New Zealanders are in favour of legalising or decriminalising cannabis, according to a new survey. The NZ Drug Foundation poll found 64 per cent of respondents think possessing a small amount of cannabis for personal use should be either legal (33 per cent) or decriminalised (31 per cent). However, 34 per cent of the 15,000 Kiwis surveyed were in favour of possession of the class c drug remaining illegal. 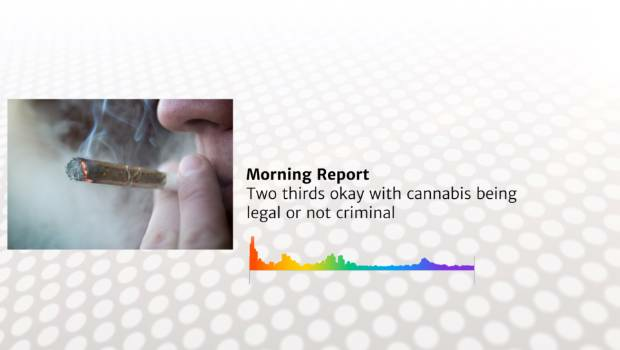 A new poll of 1000 people has found two thirds of New Zealanders want cannabis legalised for personal use or at least for criminal penalties to be removed. We talk to the executive director of the Drug Foundation, Ross Bell. NZ Drug Foundation executive director Ross Bell said it was the first time such a strong majority had been in favour of reforming the drug laws relating to cannabis. "This tells us voters are ready for change even if law makers aren't." The majority of Kiwis surveyed in a new poll are in favour of cannabis law reforms, regardless of their political leanings. The poll also found 82 per cent of Kiwis think cannabis use for terminal pain relief should be either legalised or decriminalised, and 79 per cent are in favour of cannabis being used for pain relief (legal: 63 per cent, decriminalised: 16 per cent). Terminally ill former trade unions boss Helen Kelly told RNZ there needed to be an immediate overhaul of the legal status of cannabis. Kelly said she had been "surprised" how well cannabis had helped her manage her pain relief. "There's nothing else like it." The whole system needed to change, starting with the use of cannabis for medical purposes, she said. kelly said the government's attitude towards reform was "patronising". "People need to have a think about what they're denying people like me." The poll also looked at the public's thoughts on cannabis law reform in relation to their political affiliations. The results showed attitudes did not vary greatly between voters. "This poll shows that it doesn't matter what party people back, there is consistent support to move away from the criminal justice approach to drugs," Ross said. Labour leader Andrew Little floated having a referendum on legalising cannabis last week, but has since insisted it was not a priority for Labour. Prime Minister John Key said it wasn't on his Government's agenda either. He told RNZ it would be sending a message that "increasing drug use is OK". Key believed police "for the most part" did not prosecute people with small amounts of marijuana and especially those who used it for medicinal purposes. He admitted the law was not working "perfectly". However, he compared the issue to synthetic cannabis. "If you legalise cannabis, you're gonna have to sell it somewhere. In the end you'll have a shop, just like you had a legal high shop. "It won't be long before you'll have communities who are on the station saying, 'Hey at 9 o'clock in the morning all of these people gather round. This is not the message we want for our young people'." The NZ Drug Foundation favours the removal of criminal penalties drug use, possession and social supply, the development of a strictly regulated cannabis market, and greater resourcing for prevention, education, treatment and other health and social interventions for people who use drugs. The government's National Drug Policy includes a review of some offences and penalties in the Misuse of Drugs Act, which will begin in 2017. * Audio courtesy of RNZ.